If you're the kind of player who loves rock in all of its forms, we'd advise you to dive in - pronto! Impeccable build quality. Superb classic rock tones. Slick maple neck. If you had the opportunity to stroll into Hugh Manson's workshop and commission the genius luthier to build you an instrument, what would you request? We'd head straight for the weird stuff - Fuzz Factories, X/Y pads, Sustainer pickups - but ignoring Matt Bellamy's preferred appointments for a moment, it's easy to forget the MA is a hugely playable design in its own right, and works in almost any configuration - exactly what the MA-1B Classic sets out to prove. With a 'Cider Apple Red'-finished alder body and cream scratchplate, plus a proper USA Bigsby B5 vibrato, the Classic is a far cry from Manson's usual black and silver creations. "Our review model was impeccably put together, with a meticulously applied finish and impossibly tight neck pocket"
We were expecting it to look incongruous on such a quintessential rock machine, but in the flesh, it looks utterly cool, and brings to mind similarly classy T-types for Messrs John 5 and Jack White. Like the rest of the MA-1 range, the Classic is built in the Czech Republic, then set up, checked and rechecked back at the Manson ranch in Devon, before it's packed up in a seriously high-quality padded gigbag and sent on its way to you. And also like its fellow models, our review model was impeccably put together, with a meticulously applied finish and impossibly tight neck pocket. 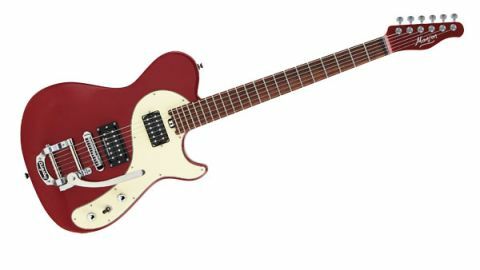 Compared with an MA-1 EVO or Cort's MBC-1 Matt Bellamy Signature, there's a bit of extra weight here owing to the Bigsby, but the rear belly-cut body outline is comfortable as always, while the tidy 'soft V' neck profile remains the same, too; in practice, it's like a modern C shape, with the slightest hint of V.
Combined with the speed-orientated satin finish, it might have a few single-cutters longing for a little more meat to rest in their fretting hand, especially bearing in mind that the Classic isn't equipped with the same high-octane tonal firepower as its MA-1 brethren. See, rather than, say, a hot Seymour Duncan JB, the Classic is packing the rather more reserved Pearly Gates, while a Jazz fills the neck. Both are loosely modelled on early PAF humbuckers, but the Jazz offers a lower output and increased top-end, while the PG is 'slightly hotter than vintage'. It's a great match for the guitar's old-school aesthetic, but don't worry, the Classic isn't about to go all country on us just yet: this new configuration just opens the door to a wealth of lower-gain tones. The Jazz starts off with an even, compressed sound that works brilliantly for clean and dirty rhythm playing, not to mention fingerpicking. It gives the guitar the air of a slightly beefier, more rock-focused Tele Deluxe, which is no bad thing. "Open chords ring out with clarity and definition, while there's a satisfying high-end 'sing' to single notes"
Flicking over to the bridge, you'll find extra oomph and grit, but not so much that your amp's clean channel will spontaneously erupt into overdrive. However, add some distortion, and the guitar becomes a classic-rock machine. Although it doesn't have the midrange depth of a Les Paul, it delivers some seriously great Zeppelin and Lizzy-esque tones. Open chords ring out with clarity and definition, while there's a satisfying high-end 'sing' to single notes. While parking the selector switch in the middle gives you a little single coil-like flavour, we can't help but feel like including coil-splits as standard - you'll need to stump up an extra £50 for the privilege - would have really taken advantage of the guitar's hybrid character. After all, there's plenty of fun to be had from the Bigsby, which gives around two semitones rise or fall. The Schaller roller bridge ensures a smooth response, and it's a finely tuned vibrato. We love the MA series' slick maple necks, and we've never been known to say no to a good waggle on a Bigsby. Putting the two together may seem illogical to some, but if anyone can make it work, it's Manson, and the Guitar Works team have pulled it off. Is it the MA for you? It's more of an acquired taste, certainly, but we can see the Classic's hybrid charms earning it cult status in years to come, especially considering its limited-run status. So, if you're the kind of player who loves rock in all of its forms, we'd advise you to dive in - pronto!